Some of the birds on my "life list" are pretty great birds. Like a Kirtland's Warbler I saw in Ohio. Or the Olive Sparrow I saw in Texas. But I have to admit that if it hadn't been for the outstanding birders I happened to be with at the time, I probably would not have seen these birds, let alone identify them. So it's always quite satisfying when you find and identify a new bird, an uncommon bird, or hard to find bird all on your own. We had this experience while vacationing in south Jersey this May. The first bird we sighted and identified was a Clapper Rail while on the wildlife drive at Forsythe National Wildlife Refuge. I always considered rails very hard to find and observe, being secretive and skulky, as well as very well camouflaged. Lucky for us, the Clapper Rail is relatively big (nearly 15" tall) and often emerges from the marsh at low tide to forage in the relative open along the edge of the marsh. Rails can be very difficult to find when amongst the marsh grass. When he was up in the grasses, he was very hard to see. But he also spent a lot of time in the mud flats, allowing us many good looks at this chicken-like bird. After finding the first one, we got better at looking for them in the marsh, and by the end of the 8-mile drive, we had observed three clapper rail individuals. The other great bird we found and identified was seen swimming on an impoundment at Matt's Landing in the Heislerville Wildlife Management Area. While using the spotting scope to check out the shorebirds, we noticed a different-looking medium-sized bird with a rufous neck, white chin, and dark back. It was quite a bit more active than the other birds, swimming around somewhat erratically while other shorebirds waded nearby. There was no mistaking it as a Red-necked Phalarope. As I learned later, they forage by spinning in circles, creating water movement that circulates food up towards them. Once we became aware of the phalarope's rather bright markings (compared to other shorebirds) and their active habits, it became quite easy to find it repeatedly. We even got to point it out to a few of the more experienced birders who had heard that a phalarope was seen in the area. We still needed someone else to point out a White-rumped Sandpiper to us, but we did leave New Jersey happy with the special finds we were able to locate and identify on our own. Shorebirds are tough, and we'll take our successes one or two at a time! My second interview is with Ben Lizdas whose 2011 Midwest Birding Symposium topic will be Answers to Your Optics Questions. Many binoculars and scopes are now carrying an HD or ED label. What does this REALLY mean, can the label be applied indiscriminately, and is it worth the extra money? The term “ED” refers to extra-low dispersion glass. This type of glass is denser and has better light transmitting properties. Colors tend to be truer, contrast is sharper, and overall resolution can be improved. Having said that, all ED glass isn’t equal, there are different grades. There are models which use ED glass that sell for $300 which won’t provide as nice of a view as some models using ED glass that may cost $600 for example. ED glass is best viewed as part of lens system that can enhance your view, but the degree to which that is accomplished will depend on the other elements (lens coatings, prism glass, etc…) Just because you put racing tires on your Ford Fiesta doesn’t mean it will go as fast as a Maserati. The term “HD” on the other hand does not refer to a specific glass type but is rather more of a marketing term used to define an entire lens system which often times uses ED glass elements. I suppose this term could be used indiscriminately though to date I haven’t seen anything that I would consider a flagrant abuse of the terminology. The best indicator to a binoculars overall performance by and large remains the price. It’s hard to say on a consumer’s behalf if the added cost is worth it though I can objectively tell you that the more expensive binoculars on the market are noticeably better than the less expensive models. The ideal point on the cost-to-benefit ratio curve will largely depend on how deep your pockets are. I would rate the $300-$600 price range to be the sweet spot in optics where a consumer gets some of the best performance for the money. Many birders purchase optics in that price range and seldom feel compelled to upgrade. Having said that, you can’t buy a pair of binoculars for $600 that give you the same view of those costing $2000. Those top shelf models cost that much for a reason. Is interest in digiscoping waning? I would say that interest in digiscoping is as popular today as it’s ever been. Digiscoping can be both fun and easy, so what’s not to love about that? I think the biggest obstacle for the end user is to find the right mix of camera/adapter/spotting scope. That’s where the challenge lies and where good technical assistance when making your purchase can make all the difference. Once you have equipment that complements each other nicely, digiscoping is a piece of cake. If you’re struggling with your digiscoping equipment, the experience can be quite frustrating. Why has it been so difficult to develop excellent two-function binoculars like zoom binoculars or binoculars with a built-in digital camera? Binocular design always involves compromise. You gain magnification, you lose field of view. You can make a binocular small and light weight but you’ll lose low-light performance. Zoom binoculars represent a good example of how these compromises make it difficult to make a high quality zoom. With the various lenses working at multiple focal lengths, it’s almost impossible to make a zoom binocular with adequate eye relief for eyeglass wearers. Another drawback is that zoom binoculars are mechanically complex because you need to have precise magnification adjustments working in unison for both your left and right eyes. Over time, most zoom binoculars wear into a cycle where the magnification in one eye is slightly different than the other, to a point where eye-fatigue is inevitable. The end result of an product well engineered to overcome some of these issues would likely come at a price point that would be beyond what most consumers would be willing to pay over a standard, fixed magnification binocular. A similar problem is at the heart of the digital camera/binocular. Consumers love the concept though to develop a product that would meet the expectations of what most consumers have about how such a binocular would function, would result in a pair of binoculars costing upwards of $5,000, and likely not having as good of an image as “standard” models costing a fraction of that. Zeiss for example, recently developed a spotting scope with an integrated camera. The optics were great and it was user friendly. It also cost $6,500 which just took it to a place in the market where very few consumers are able to reach it, despite it’s wonderful design and attributes. With binoculars having two barrels rather than one, you can imagine how a pair of binoculars with similar capabilities could be more complex and could cost even more! What advancements do you see coming in optics in the next 2-3 years? Everybody likes compact and light weight. Finding ways of making binoculars smaller and lighter while not sacrificing optical performance is going to be an item on the development frontier. It’s hard to imagine the current performance levels of top-shelf binoculars leaving much room for improvement. I would expect to see current high-end brands continuing to push the innovation boundaries and at the same time, getting to be more expensive. I can also imagine that we will continue to see mid-priced binoculars getting better and better, offering consumers a degree of performance that continues to narrow the gap between what is “affordable” and what is “the best”. 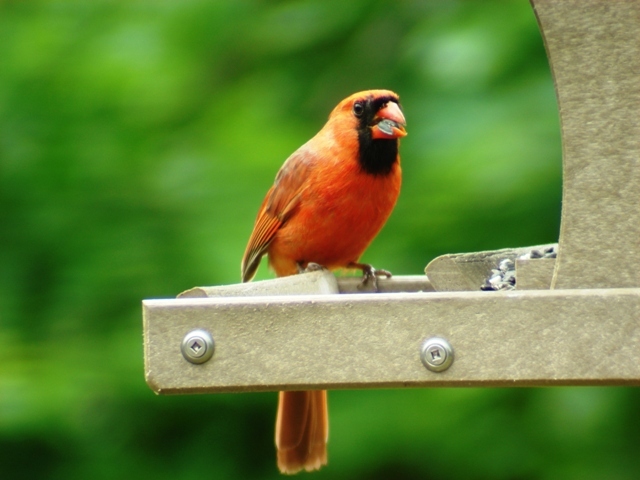 Many readers of this blog are backyard birdwatchers and casual birders. If you had just $300-400 to spend on binoculars, what would you get? $300-$400 can get you a really nice set of binoculars with all the features sought by casual and avid birders alike. Our most popular binocular is the Ranger 8x42 and it’s the one I recommend the most to friends and family. 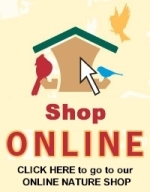 It has all the features that a birder or naturalist is looking for. It’s compact and light weight for its size, good for eyeglass wearers, and has a fully-multi coated lens system with dielectric prism coatings. The end result is something both comfortable to hold and look through at any point in the day. For those whose interest goes beyond just our feathered friends, the Ranger’s 5-foot close focus makes it just as suitable for enjoying butterflies, beetles, and plants. In a nutshell, the Ranger has all the features (though maybe not the same performance) as a $2,000 pair of binoculars, though at a fraction of the cost. You don’t need to take my word for it though, as it’s one of the most highly reviewed products by our customers. Thanks Ben, that's great information. I'll be interested to hear questions from other attendees at the symposium! Ben Lizdas answers loads of questions each day from bird watchers looking to purchase the right binocular or spotting scope. This experience, along with his many appearances at birding and nature festivals across North America, makes Ben uniquely suited to offer solid advice on optics for bird watchers. Bring your optics questions along and Ben will answer them during his session at the Midwest Birding Symposium, September 15-18, 2011 at Lakeside OH. Click here to register. Check back in a couple weeks for an interview with Symposium speaker Nicolle Peretta, the Bird Call Lady. Click here to read my interview with wildlife photographer Marie Read. After I had saved my Grosbeak Gallery post, I remembered that I had some Rose-breasted and Evening Grosbeak images that I had digiscoped all on one day in mid-July. So I'll share them with you now. I digiscope with an older Nikon Sky & Earth Series scope, 15-45x, 60mm objective lens. It's a smaller scope, but I like the close-focus capabilities of it. I spend most of my digiscoping time in the 15x zoom range. I dream of getting a new scope, but this one will do for at least a while longer. I use a Sony Cyber-shot DSC-N2 with Carl Zeiss 3x zoom lens, 10.1 megapixel, and a large touch-screen LCD. The Zeiss lens sold me on this camera, and the touch-screen LCD display is especially helpful when digiscoping. I attach the camera to the scope with a Vortex Universal Digiscoping adaptor (small). I often just leave my camera attached to the scope. This keeps my digiscoping setup ready to go! My tripod is an older Bogen 3001 and an old, cumbersome Manfrotto head. I'm looking to replace that head with a better tripod head for digiscoping. Any suggestions out there??? The sixth annual Great Adirondack Birding Celebration (GABC) is scheduled for June 6-8, 2008 at the Adirondack Park Agency Visitor Interpretive Center (VIC) in Paul Smiths. All programs, including field trips, are FREE. Registration is open for trips/programs by calling (518) 327-3000. The 2008 Great Adirondack Birding Celebration will feature birding trips, lectures, workshops and the popular Teddy Roosevelt Birding Challenge. Wild Birds Unlimited - Saratoga Springs will be there with a nice selection of binoculars and spotting scopes, including digiscoping set-ups. 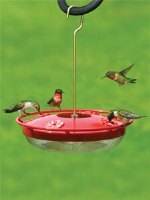 The guest speaker at 7 p.m. Friday, June 6 will be Lang Elliott, the author of many book/CD packages, including Common Birds and Their Songs, Music of the Birds, and The Songs of Wild Birds. He is the owner of NatureSound Studio, which he created in order to celebrate the sounds of nature. The keynote address at 7 p.m. Saturday, June 7 will be given by Miyoko Chu, author of "Songbird Journeys: Four Seasons in the Lives of Migratory Birds." Download the field trips list. (A 49k pdf file). All field trips are FREE though registration is required at (518) 327-3000. For more information about the Great Adirondack Birding Celebration, contact Lydia Wright at (518) 327-3000. Last weekend, we had a booth at the Adirondack Sports & Fitness Summer Expo. We were there to introduce local outdoor enthusiasts to our Wild Birds Unlimited Nature Shop, especially our great optics selection. We brought a great selection of binoculars by Eagle Optics, Vortex Optics, Stokes, and Leupold, and we introduced many show attendees to digiscoping, which is taking photos with a digital camera through a spotting scope. The cardinal image below was digiscoped in my yard. At the show, we highlighted two spotting scopes. 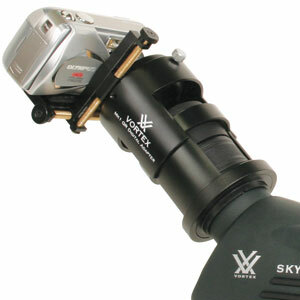 We showed the Vortex Skyline scope with the optional MK1 QR Digital Camera Adaptor. The scope has a fantastic 20x-60x magnification, and the 80mm objective lens ensures bright, sharp images. 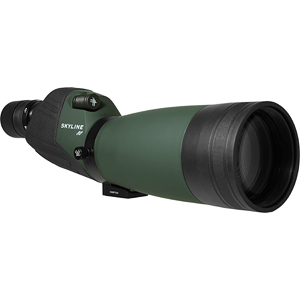 The digital adaptor fits the Skyline scope (only) and provides a quick-release feature that allows you to switch from using the scope to digiscoping in seconds. Watch this 5 minute video on YouTube showing the Skyline scope and digital adaptor in action. 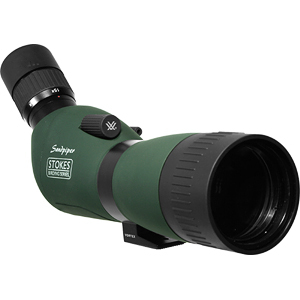 The other scope we showed and are especially excited about is the Stokes Sandpiper scope. "An even nicer surprise was the Vortex Stokes Sandpiper, which at $359 or less could be the best buy of any model we tested." 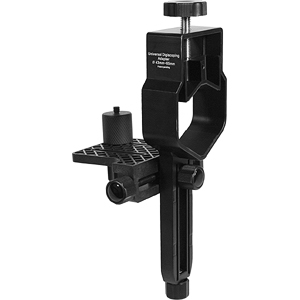 "With so many fine scopes on the market, choosing the right one should be easy and fun. Your selection should be based on budget— how much you can really afford—and the kind of birding you do most, or hope to do more of with a new scope. If you’re on a tight budget and want decent optics in the least expensive package, I’d try the Vortex Stokes Sandpiper." Here's a link to the full Scope Quest 2008 article. And read what Don & Lillian Stokes themselves have to say about the scope. 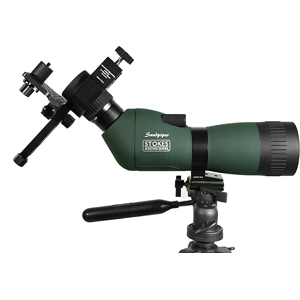 This is a great mid-priced scope that can help get you into the digiscoping hobby. Digiscoping with this scope is accomplished with the use of a Vortex Universal Digital Adaptor. The universal adaptor can work with just about any scope. The adaptor seats the camera securely behind the scope eyepiece to provide the stability required to enhance your digiscoped images. On Saturday, I conducted a seminar called "Capturing Images of Your Backyard Birds" to help attendees attract birds to their feeders and to take photographic or digiscoped images of the birds. NOTE: If you know of a local group that would be interested in this presentation or other optics or bird-related presentations, please contact us at wbu@nycap.rr.com. It was fun talking about binoculars, spotting scopes, and digiscoping to a whole new audience. Stop by Wild Birds Unlimited - Saratoga Springs to check out our great optics selection.